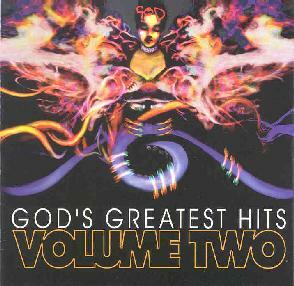 God - "God's Greatest Hits: Volume Two"
GOD are a foursome from NY who sound to me like a cross between Zappa and perhaps SoCal humor-rock groups the Rugburns and the Ziggens. The first track "Cold Opening" seems to go everywhere in its 7 or so minutes, shifting musical and vocal styles at the drop of a hat, but after repeated listens it all coalesces and is clearly well thought out. Hard rock, doo-wop, hip-hop, spanish guitar, Hawaii and more are all represented, though often as back-drop to the vocals, which remain the immediate focus throughout the whole album. It culminates in a sweet guest-vocal by Cynthia Glass. The playing is tight and melodic, the production is perfect, Danny Rockett has a good voice and the group has a satirical but fairly light sense of humor. There are moments where they come close to just lifting some Zappa right off the record, but mostly things remain pretty original. "Cash on the Nose", like many of the tunes here, treats pretty serious lyrical topics with nonchalant humor. Musically it's perfectly smooth, and the backing vocals from Mugwump Jizm, Ethan and Dogmeat continue to add extra flavor to the tunes. Amidst all this, the group comes up with plenty of hooks, chorus and elsewhere. "Kinko" has very Zappa-esque kazoo and didgeridoo, keeping things lively with varied instrumentation, as is the case with many of the other tracks. "Psychotic Delight" is some fun studio-goofing though rather brief, segueing into "7:13", a more serious song about heartbreak. "Delivery Boy" is a blatantly brutal satire on the stresses of the average delivery-boy in the big city, though this particular boy reacts in a murderous fashion ("I have the quickest draw of any delivery-boy in town") which we should hope will never actually happen, if it hasn't already. But after wasting a few innocent but lazy deliverees, he gets his, when a customer pulls a piece of his own, condemning the boy to eternity as "the devil's delivery boy". The music is cheesily dramatic hard-rock, the vocals Beasty Boys-like rap, and it's all great fun. Next we are introduced to a pretentious psychedelic doctor who speaks briefly on "Trans-Dimensional Reality" which precedes the ponderous "imnotwhatyouthinkasmeanymore", the lyrical theme of which I've yet to decipher, though it seems clever enough and utilizes more competant vocals and interesting samples. Closing track "The Future" is another winner, a humorous litany of sci-fi cliches as to speculations on futuristic lifestyles and calamities, while the music comes the closest to space-rock but obviously in not too serious a fashion. These guys are loaded with creativity, humor and youthful energy and almost live up to their name. I look forward to hearing more. For more information you can visit the GOD web site. Email the band at god@godtheband.com. Contact via snail mail at 780 Madison #3A; NYC, NY 10021.